For the first time in years, the average gap between official fuel consumption figures and actual fuel use for new cars in the EU in 2017 did not increase according to an updated analysis by the ICCT. However, the gap only stabilised at 39 percent. The ICCT says that the discrepancy between official measurements of vehicle efficiency and actual performance of new cars in everyday driving has more than quadrupled since 2001. 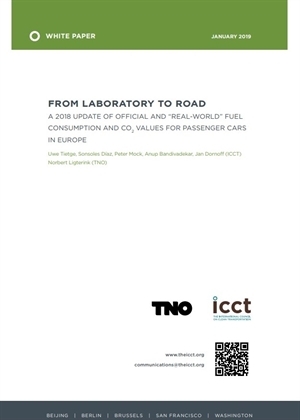 The 2018 update of the ICCT's "From Laboratory to Road" series covers approximately 1.3 million passenger cars from 15 data sources and eight European countries. The new WLTP fuel economy procedure began to be adopted towards the end of 2017, so the latest results do not reflect this significant change to the test process and figures. Between 2001 and 2017, average official CO2 emission values of new European cars decreased from 170 g/km to 119 g/km over the New European Driving Cycle (NEDC), a 30 per cent decline. But the official CO2 emission values are determined in a controlled laboratory environment. The gap between real-world and official CO2 emission values grew steadily between the early 2000s and 2016, effectively cancelling out two-thirds of the on-paper efficiency improvements since 2001. The ICCT says that for an average consumer, the current gap level translates into fuel expenses of around 400 euros per year in excess of what would have been achieved based on official fuel economy figures. Because vehicle taxation schemes and incentive schemes for low carbon cars are based on official CO2 values, the ICCT says that the gap may also lead to significant losses of tax revenue and misallocation of public funds. Seeking to explain the stabilisation of the 'gap', the report says that a number of factors may have been at play. ICCT says that there is currently limited regulatory pressure on car makers to increase vehicle efficiency, as the next set of CO2 targets will not apply until 2020 and, furthermore, that increased scrutiny of real-world performance of vehicles may have acted as a deterrent to further test optimization. The report says that the decline in diesel shares of new car registrations also plays a role in the stabilization of the gap, as diesel vehicles tend to exhibit a higher gap than their gasoline counterparts. The ICCT says that the new WLTP test procedure, introduced for new vehicle types in September 2017, "will likely produce more realistic CO2 emission values". However, it says that there "are indications that a substantial divergence could remain in future years". The European Commission is required to assess how data from fuel consumption meters can be used to prevent the real-world gap from growing by June 2023 at the latest. In 2027, the Commission must furthermore assess the feasibility of adjusting each manufacturer’s average CO2 emissions for its real-world performance, beginning in 2030.